One use that might lead to a broader acceptance of drones on the construction site is their usage for inspection purposes. They can be safely used for construction progress inspections, critical to getting a “draw” for project completion for the contractors. They can also be used to verify materials delivery and stocking on the job site. According to a recent Construction Dive article, the city of Spokane, Washington. will begin using its first drone to inspect their public works projects throughout the region by the end of the summer. The technology will help save taxpayer money by speeding up the construction process, saving overtime pay the city pays its inspectors and will accomplish the inspections more safely. Spokane will use the drones for inspections where it is difficult or unsafe for humans to go. An example used in the article by Kathleen Brown is the inspection of cell towers. In order to do these inspections today, a skilled technician has to climb the tower. That requires safety equipment, a worker who can climb to dizzying heights and who can then fix whatever is broken or needs adjustment. The drone can do those inspections more efficiently, safer, and can provide real time information so critical to ensuring a continuation of service. Currently, the drone that Spokane is purchasing costs $15,000, and there needs to be someone who can fly it safely. Drone pilot is a new skill, and there are a number of programs designed to accommodate professional and hobbyists who want to become certified to fly the drones. The FAA is currently developing rules to govern the safe use of the drones, and I will have something to say about that in a future post. 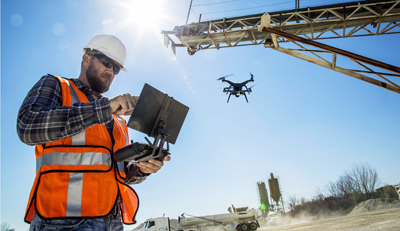 We expect to see more cities experimenting with the use of drones for infrastructure inspections, construction progress inspections, survey verifications and even environmental inspections where sending in a human inspector might be extremely dangerous. This is another instance where the new drone technology can assist in the construction process. Look for them soon around your construction site.